March was a crazy busy month here at the cottage but we do have some results to show for all of our hard work. That’s not the case every month, and that’s ok, but we are starting to see bits and pieces of the house come together. Baby steps. We also celebrated an anniversary, of sorts. 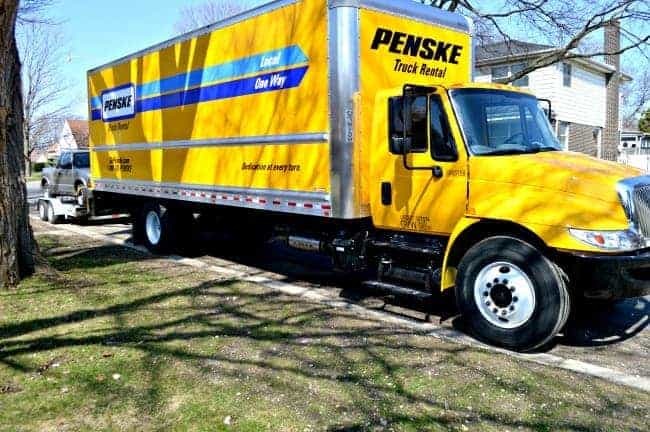 It was one year go that we packed up our life in Chicago and drove the moving truck down the Interstate to begin a new life in North Carolina. We’ve been through a lot this past year, and it’s been a lot of work, but it’s all been worth it. The hubs and I both grew up in New Jersey but we’ve lived in the South for a lot of years and we feel right at home here. Like I said, it’s been a busy month but we did complete a few projects. I finally finished our fireplace, and it’s no longer an eyesore. I also finished painting our kitchen/dining room walls and the old casement windows were transformed with a bit of black paint. I’m loving the results and I’ve gotten so much feedback about them. All of it was good! I have a couple of things left to do in the kitchen before I can call it done. 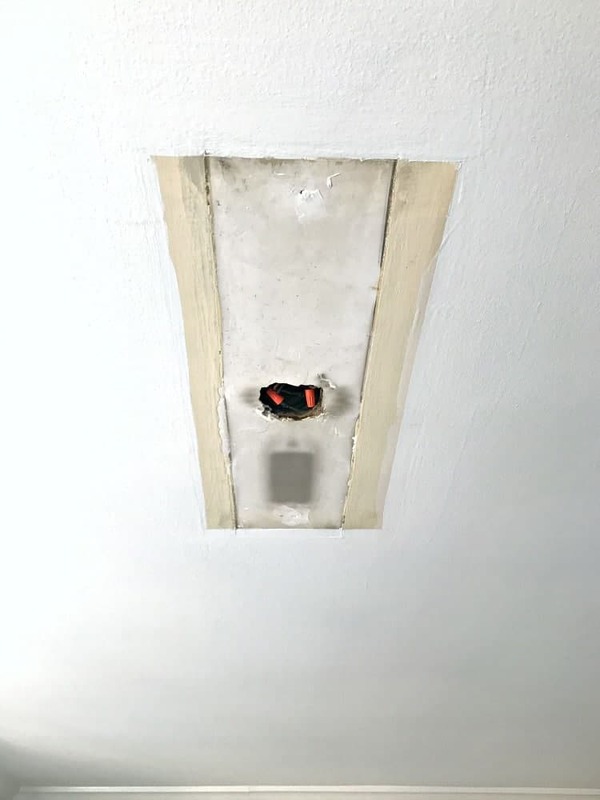 The holdup is the ceiling light fixture. I’m having a (very) tough time finding something that I like. I’ve already ordered and returned 3 lights that have either been too big or too small. Let’s hope the 4th one’s the charm. I’m tired of looking at the hole in the ceiling and the mess on the island. I always try to show pretty “after” pictures but this was our reality for a large part of the month. Another project we worked on last month was the basement door. I talked about the state of our old doors and door knobs in this post, but the basement door was a total mess and beyond help. 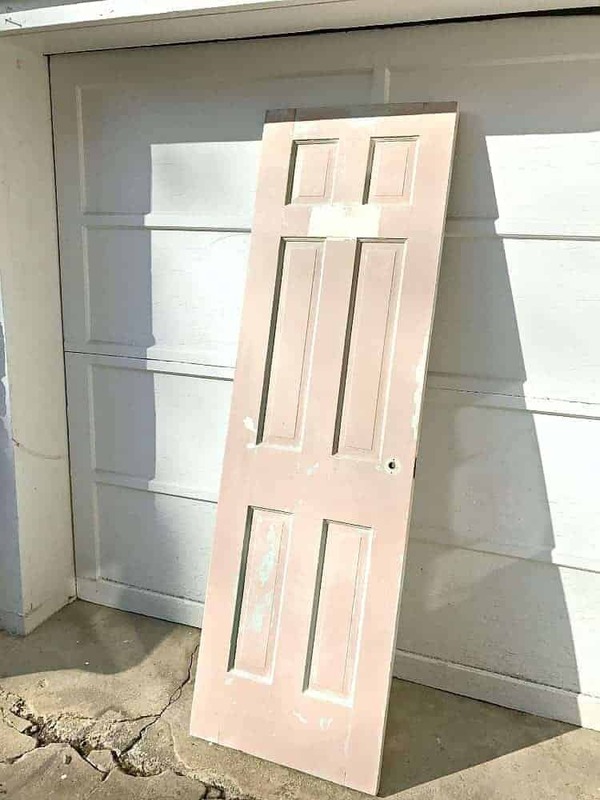 We’re almost done fixing up a door we found in the basement to replace it. Not an exciting project but it’s going to look so much better. I’ve got several projects going at once but I’m always dreaming of a new one. Since we started the basement door, which is in the living room, I’ve been looking at ideas to finish the room. 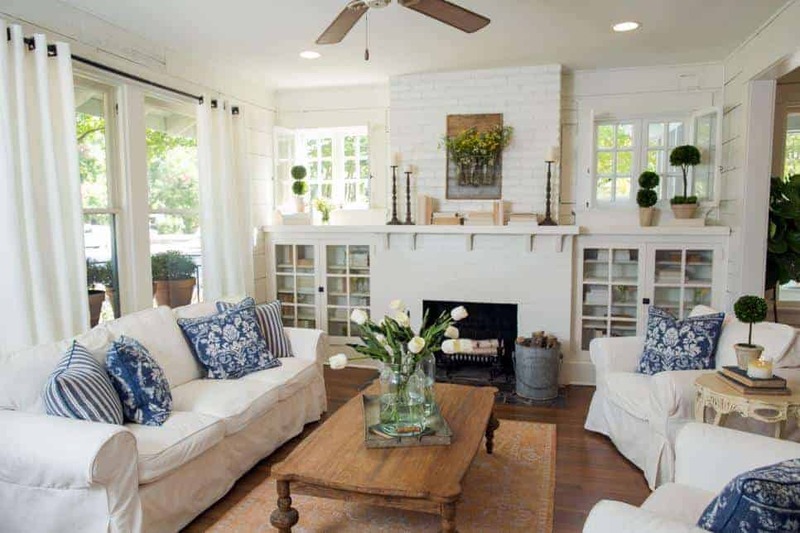 Love this room from Fixer Upper. *Affiliate links used. Please see my Disclosure for more info. 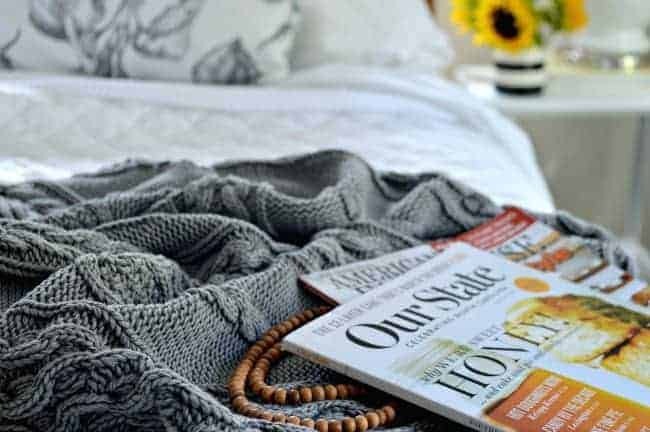 Moving from home decor and projects to fashion. Hey, a girl’s gotta wear clothes while she works on her house, so I like to share one or two favorite things each month. April brings warmer weather, which means pulling out the spring wardrobe. I usually try to get a few new tops in the spring to last me through the summer. I found these 2 cute tops, here and here (affiliate links), and have been wearing them a ton (just like my pillow covers I’m a sucker for striped tops). Plus they’re on sale right now! I’m looking at a couple more tops (no stripes) and I’m replacing a few of my makeup staples. I’ll let you know if they make the cut. What do you have planned for April…anything fun? Thanks so much for stopping in. Hope you have a great week! I love your living room. It is so cute, cozy and “cottagie”! New word! I love your style, and your home is lovely!! Thanks so much Sue. If you’re referring to the last picture of the living room, sadly it doesn’t belong to me. It’s from HGTV, Fixer Upper. I forgot to credit it but I fixed it. Sorry for the error. Is that your home at the bottom? 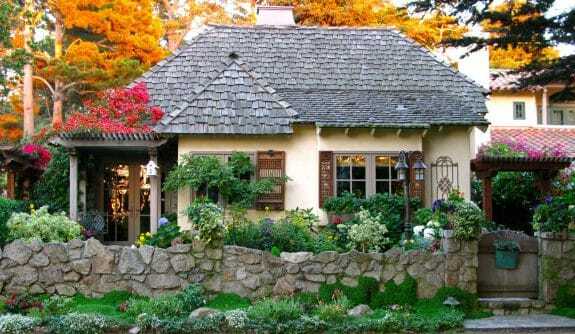 Cutest cottage ever! 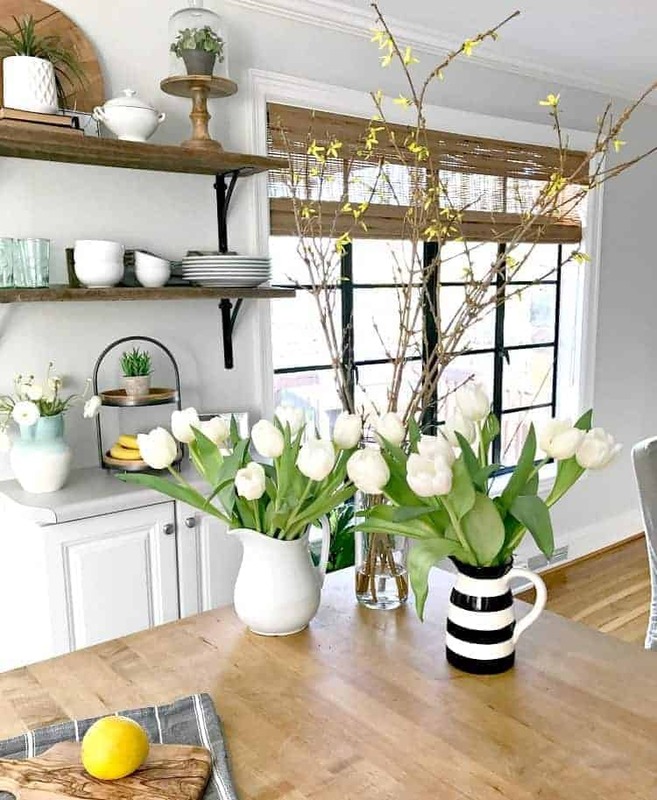 I love the black windows in your kitchen…and everything else you are doing. Cute, Cute, Cute! I know what you mean, projects are always on the horizon. My hubs wonders why they never get all done 🙂 We are planning a new deck this spring. It is almost falling off the house and we had to put some braces in to keep it sturdy. Will be so nice though. Happy April. Thanks so much Jillian, I appreciate it. I know what you mean, my husband is the same way. Sadly, it’s not my room. I didn’t credit the photo properly but it’s fixed now. It is from HGTV, Fixer Upper. Good luck with your deck build. I’m sure it’ll be awesome when it’s done! I love the craftsman look of the fireplace wall. Just love, love it! The kitchen is coming along. Can’t wait to see what you do next. How about a picture of the wall where the old basement door is. Or are you saving that for the big reveal? . I wasn’t following you when you decided to move. What prompted that decision? All your accomplishments makes me want to get a move on! I probably have more projects to finish that you. I’ve lived in my house 15 years and it still isn’t done! Money and energy major factors. No hubby to help and skill set needs improving. No better way than to jump in, always fighting with that perfectionist that lives inside me. Thanks Rose. The kitchen is coming along. 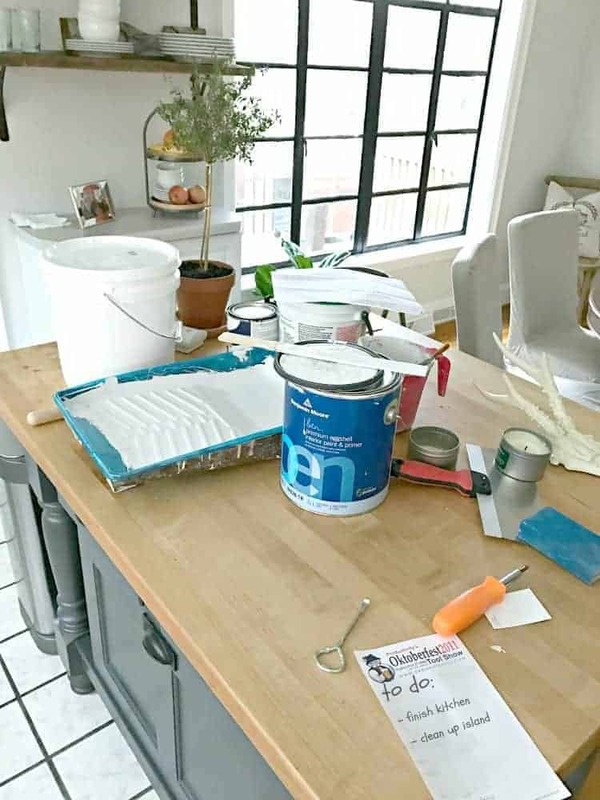 We have plans to remodel the countertops, cabinets and floor at some point so this mini makeover is enough to get us by for a while. The picture with the fireplace wall is not mine. I was referring to it as inspiration and didn’t credit it properly. I fixed it and it’s now linked to HGTV, Fixer Upper. Sorry for the error. It’s a beauty though, don’t you think? We have a ton of projects too. I think that’s how it is when you have a house. I love doing it all though and like to learn new things so, for me, the longer the list the better. I hear you about being a perfectionist though. I’m definitely that way too. I don’t stop until the project I’m doing looks the way I pictured in my head. It may take me longer to do, but I work through it. Thanks so much for stopping in today. Hope you have a great week. Isn’t it amazing to look back and see what all you have accomplished? I think I will take pictures every month, before and after so I can look back at what I have accomplished. I get over whelmed sometimes and that would be a nice boost. I love your living room, so welcoming, well all your rooms are welcoming truth be told. I know what you mean about the light fixture. I looked for three years for a dining light fixture for the condo. I finally found it and then moved. LOL So the hunt is back on, this time for the art/quilting studio. You inspire and encourage me my friend. Have a great week Kristi. Pictures would be a good reminder for you. They really show the progress you make. It’s hard to see what you’ve done when you have rooms that aren’t finished and 25 things on the to-do list. I get overwhelmed too but I love the process and I’m really trying to take my time and enjoy it go round. Easier said than done sometimes, but I’m trying. Hang in there, my friend. It will look fabulous and you will really enjoy it when you are done. I’ve been into blue and white myself for a while. That color combo would look gorgeous in your cottage (although any color would look gorgeous in your cottage). Sounds like a busy April for you too. Love this time of year. 🙂 I hope your bazaar is a success!